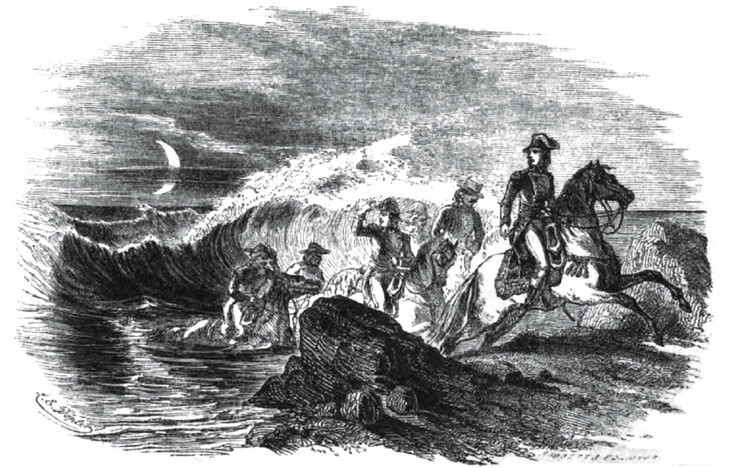 The 1755 tsunami at Lisbon, Portugal. The people ran from shaking buildings to the seemingly safe shore along the Tagus River, only to be struck by a 40-foot tsunami that had traveled up the river from the Atlantic Ocean, where the submarine earthquake had taken place. It was followed by a second tsunami wave and a third. But the tsunamis hit more than just Lisbon. 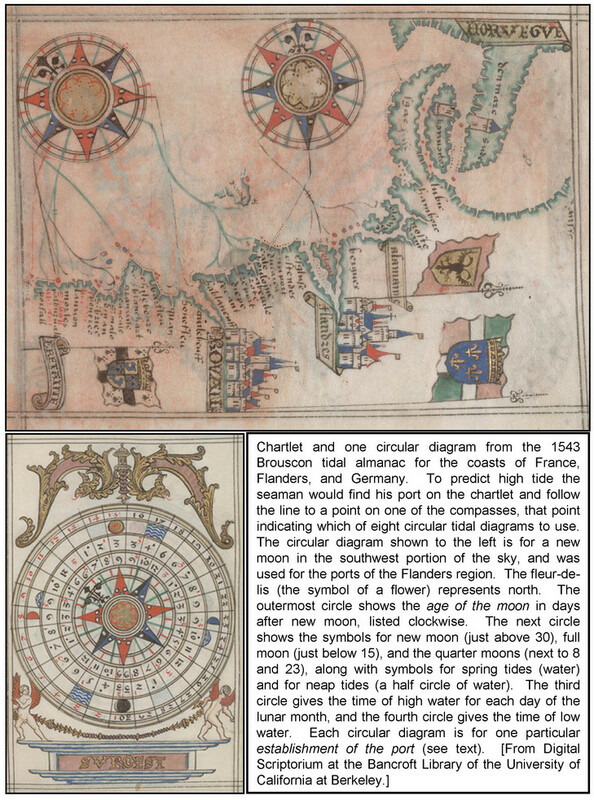 They traveled to northern Europe, to southern Europe and the northern coast of Africa, and crossed the Atlantic Ocean to the Caribbean (where the sea rose 20 feet at some islands), making this history's first contemporaneously recognized global natural disaster. This event is described in the book in detail because of the many first-hand accounts in the historical record. The data collected from many sources led to the first recognition (by Rev. John Michell at Queen's College in Cambridge ) of tsunamis as very long water waves that could travel thousands of miles. 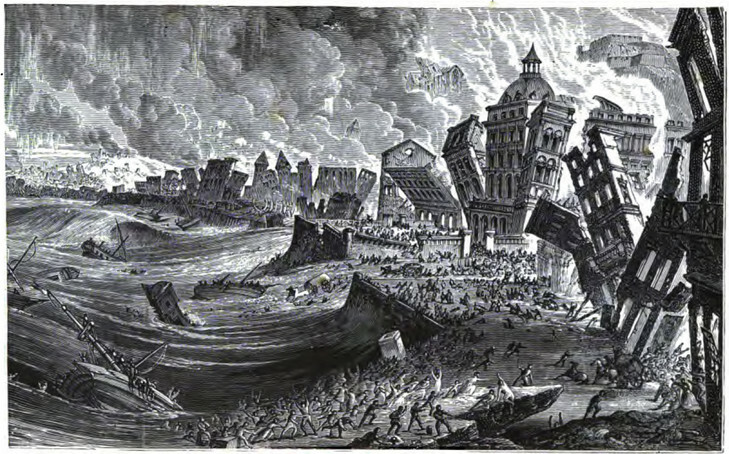 This etching is from the 1887 book by G. Hartwig, Volcanoes and Earthquakes. 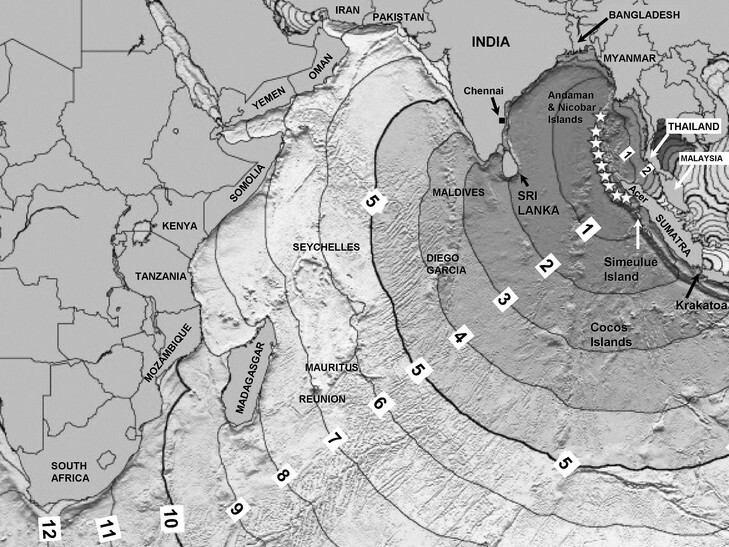 The first twelve hours of the 2004 Indian Ocean tsunami. The tsunami was caused by a 900-mile long submarine earthquake (indicated by the stars). It was the first two hours that were most devastating. 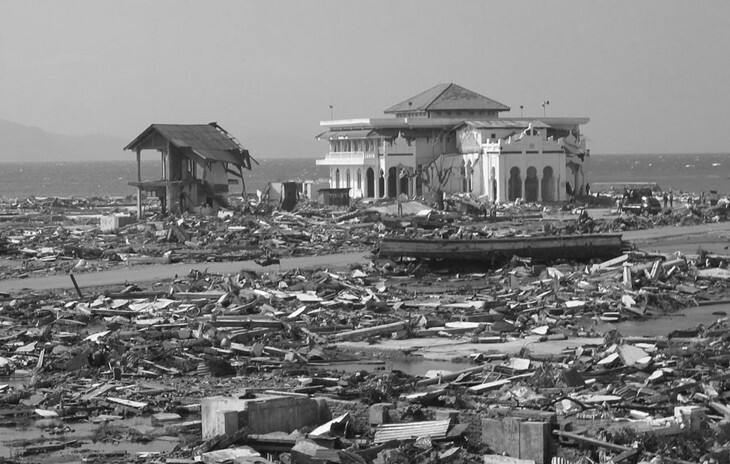 Only 17 minutes after the earthquake, a 100-foot tsunami wave bulldozed towns out of existence along the Aceh coast of northern Sumatra, Indonesia. In less than an hour 240,000 were dead. In less than two hours smaller but still powerful tsunami waves had killed 7,500 in Thailand, 31,000 in Sir Lanka, and 16,000 in India. Submarine ridges focused the tsunami wave energy like a lens focuses light, eventually guiding them out of the Indian Ocean and up the Atlantic, though now greatly reduced in size. It was that same bathymetric effect that sometimes determined who would live and who would die. More than 8,500 Sri Lankans died in Kalmunai at the shoreward end of a submarine ridge, while eight miles south only 2 died in Oluvil at the shoreward end of a submarine canyon. This is a modified version of a model-produced map from NOAA’s National Geophysical Data Center. 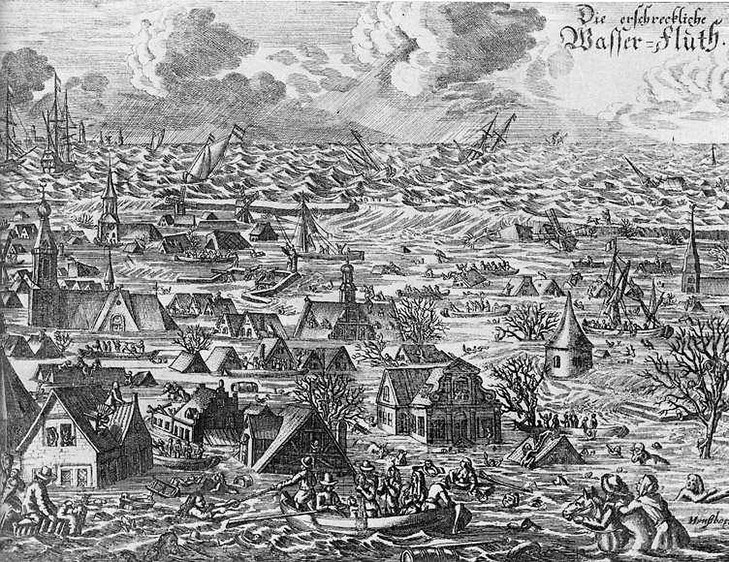 Destruction due to the storm surge produced by a gale along the coast of North Friesland, Germany, in 1634. 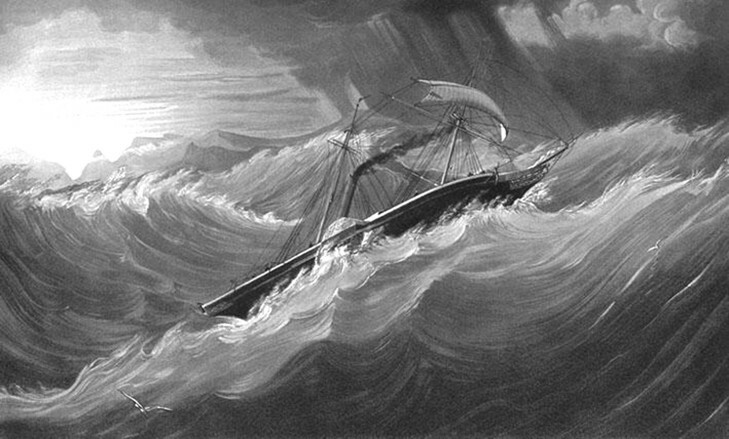 Over the centuries storm surges have killed many times more people than tsunamis. This etching, called "Die erschreckliche Wasser-Fluth" ("the terrible flood waters"), is taken from Eberhard Happel's "Greatest Curiosities of the World," published in 1683. Tens of thousands died along this coast and the coast of Holland, one of many such storm surge tragedies to occur in this region. Yet this pales in comparison to the millions that have died from storm surges (produced by tropical cyclones) along the coasts of the Bay of Bengal -- in India, Bangladesh, and Burma. The U.S. Coast and Geodetic Survey tide-predicting machine No. 2. Based on the work of Newton and Laplace, Lord Kelvin (and in the U.S., William Ferrel) built finely crafted brass tide prediction machines consisting of dozens of pulleys and gears. 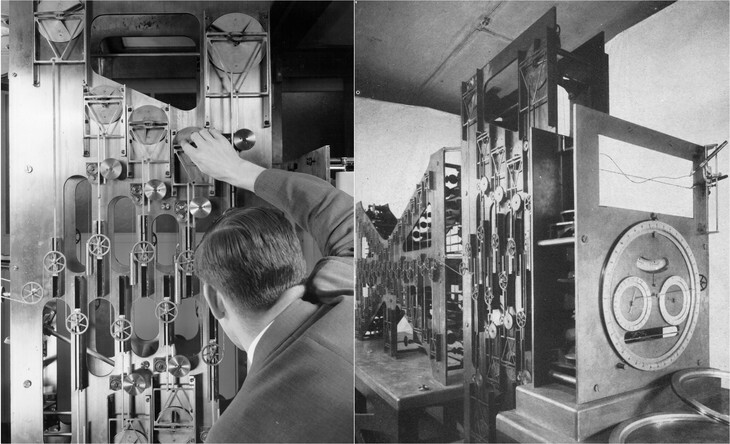 The tide prediction machine in this picture was completed in 1910 and handled up to 37 tidal constituents. 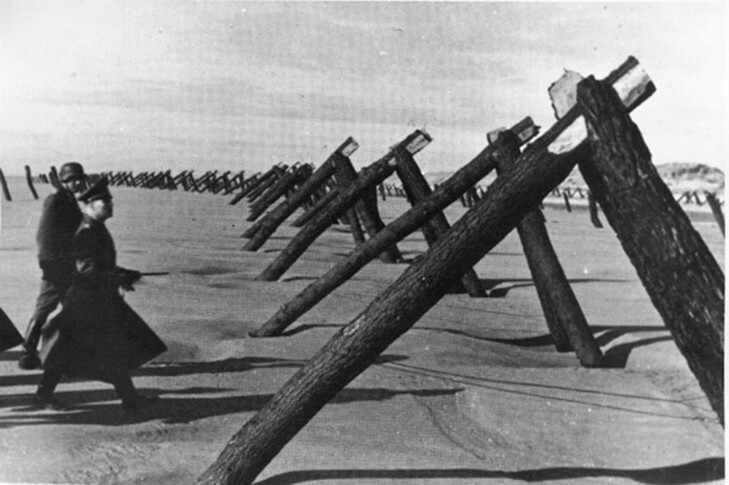 It was used during World War II to make the tide predictions for amphibious landings in North Africa and the Pacific. (Picture from U.S. Coast and Geodetic Survey, 1915.